This assessment will illustrate your students’ writing abilities within the realistic fiction writing genre. Help him tell his story from his point of view with this fun and creative writing prompt. 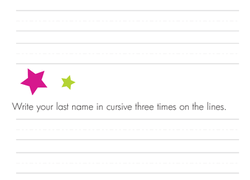 Kids practise writing their first and last names in cursive on this year four writing worksheet.